Terminal Spade #10 Nylon Yellow (12-10) TMR STNYS10 Bag of 100. 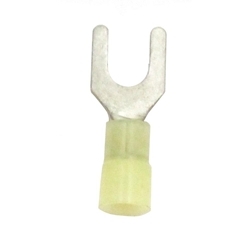 Insulated spade terminals, also called fork terminals, are perfect for marine and automotive use. The terminal design allows for easy connection and removal from screw-type connections.